The U.S. Navy will soon take charge of the first in its newest, most advanced line of warships: the angular, tech-savvy — and expensive — USS Zumwalt. The largest and most technologically sophisticated destroyer in the Navy's fleet, the USS Zumwalt will be the first of an ambitious class of three destroyers planned since the 1990s. At 610 feet long, the USS Zumwalt will be the largest destroyer in the Navy. The final cost to build the behemoth is expected to be at least $4.4 billion. The official handoff to the U.S. Navy will take place in a Bath, Maine, shipyard on Friday, Navy officials confirmed to ABC News. The USS Zumwalt has an unusual, imposing, sharp-angled geometric design that keeps most of the superstructure enclosed. Because of its lines and shape, it will be 50 times as difficult to detect on radar as conventional ships its size. 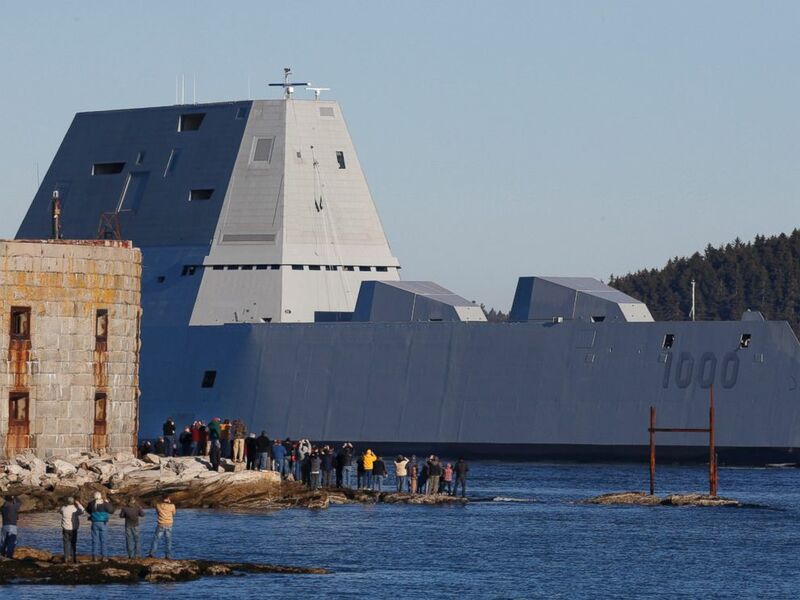 The first Zumwalt-class destroyer, USS Zumwalt, the largest ever built for the U.S. Navy, passes spectators at Fort Popham at the mouth of the Kennebec River in Phibbsburg, Maine, Dec. 7, 2015, in Bath, Maine. It's also an energy-efficient machine, whose four gas-turbine engines power an integrated electric system that runs the ship's systems, including the propeller motors. 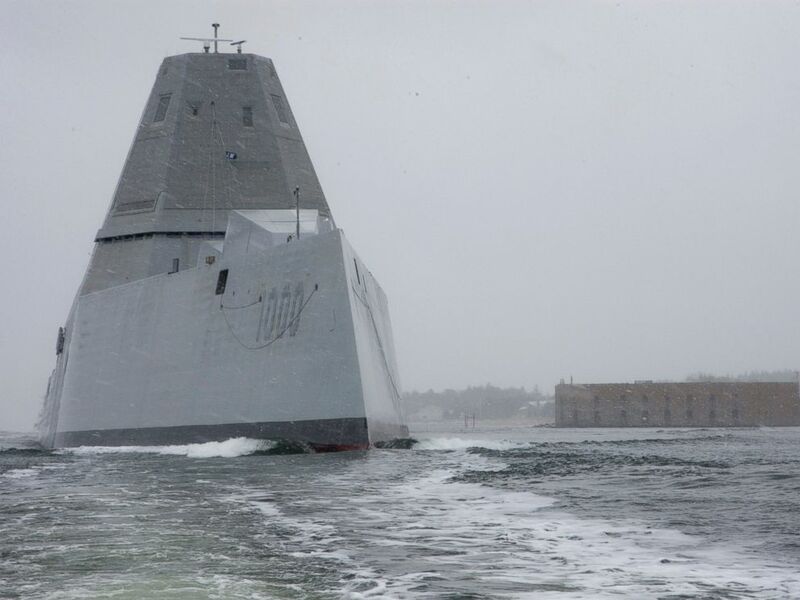 "The quiet and economical design of the destroyers' power system generates 100 percent of the energy needed for each vessel's propulsion, electronics and weapons systems," according to Raytheon, the company that designed many of the technologies and equipment on board the Zumwalt. The destroyer boasts a state-of-the-art weapon launcher designed to fire missiles for sea, land and air attacks, as well as an advanced gun system capable of striking targets over 70 miles away. This time-lapse video, posted by the U.S. Navy, shows the ship's initial launch, in 2013. The future guided-missile destroyer USS Zumwalt (DDG 1000) departs the Bath Iron Works shipyard for its second at-sea period to conduct builder's trials, March 24, 2016. During the testing phase for the ship, a lobsterman told The Associated Press that the vessel appeared to be a 50- to 60-foot fishing boat on his radar. When he saw the ship, he realized it was actually a massive Navy destroyer. In response to such feedback, the Navy added reflective material to the destroyer so it was more visible to other ships during testing. The Zumwalt is named for Navy Adm. Elmo Zumwalt, who became the United States' 19th chief of naval operations in 1970. In more than 30years with the Navy, he served in World War II and the Korean and Vietnam wars. The ship will be formally commissioned in October in Baltimore, Capt. James Kirk, the destroyer's skipper, told Stars and Stripes. The ship's home port will be San Diego.